I have the same razor & was advised it’s a Souplex Bakelite, I use it as my travel razor. Thanks for the reply and for the info Shaun! You're a legend for putting me out of my confusion. How do you find it in the shave? Very good & no hesitation in it being my regular travel razor. These beautiful Creams came today if they are anything like the one I have I can't wait to try them. I took delivery of another travel grooming kit, I paid a bit more than I would have liked - the pitfalls of being caught up in a Ebay bidding war but least the seller was a charity so I don't feel too guilty. The kit didn't come with a brush or soap. The razor still had it's blade and it was the rustiest blade I have ever seen! Horrible. But it did come with a Fat Handle Tech. I've been after one for a while, so I'm pleased with that. I think this is a British Personna Executive Injector. £5 plus postage of eBay. The pictures of the razor in the listing made it look a bit grubby, but when I spotted it still had it's dummy blade in place I could not resist. Even better no one else bid on it. Can I ask if you ever get problems taking Bakelite through security? I imagine that it is presumed that a pack of blades “is in there somewhere “ even though you are going to buy when you arrive. My razor & blades are in my suitcase in the hold. Not to mention the soaps, post shave products and various different razor blades. Right... I'm off to shave with my Merkur teamed with a feather. So looking forward to using my new silver tip brush. 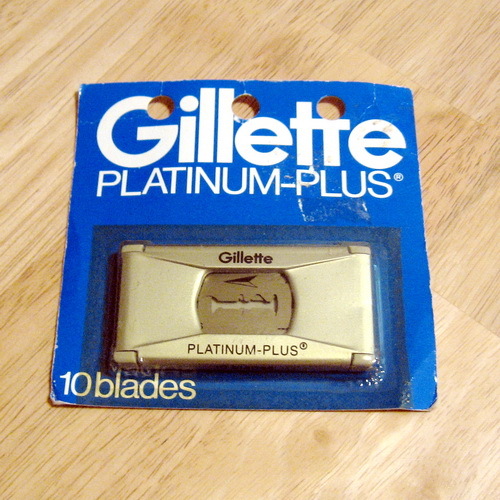 I picked up a few vintage Gillette Platinum Plus blades. It has been a long time since I have used any of them, and I thought I'd do an informal comparison of them to my Personna 74 Tungstens, Gillette Swedes, and Wilkinson Light Brigades, just out of curiosity. I have found them to be pretty much as I remembered, very sharp and efficient but slightly harsh, somewhat less smooth than Personna 74 Tungstens or Wilkinson Light Brigades. They glided well without drag, but they left me with some skin burn. Their longevity not as great: the blade lasts about 18 shaves.